Since the end of 2013, France has sent more than 1200 soldiers to the Central African Republic – including a large number of foreign legionnaires. They come from different countries and fight for a common cause: the end of the civil war. Edouard Elias accompanied the troops. Born in Nîmes in 1991. After spending ten years in Egypt, Elias returned to France and studied photography at the Écoles de Condé in Nancy. After doing a reportage on a refugee camp in Turkey, he began to document the Syrian civil war. He spent ten months in prison there. His work has appeared in Der Spiegel, Paris Match and in the Sunday Times Magazine. 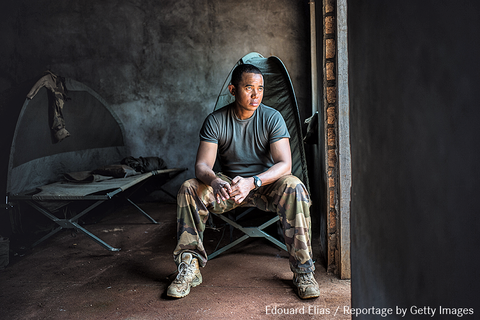 Read an interview about his experiences in the Central African Republic on the Leica Blog, and watch the Video here.